KMFDM is a German industrial band led by founding member Sascha Konietzko. They have sold over 2 million records worldwide. KMFDM was founded in Paris, France on February 29, 1984 as a joint effort between Konietzko and German painter/multi-media performer Udo Sturm to perform for the opening of an exhibition of young European artists at the Grand Palais. Sturm had no lasting musical aspirations, and Konietzko was more interested in studio recordings than the occasional art performance, so he began collaborating with then-Hamburg-based studio owner Raymond Watts and drummer Klaus Schandelmaier, who adopted the stage name En Esch. After working the Hamburg underground music scene and releasing three albums on European labels, the band began its long-standing relationship with Wax Trax! Records when their 1988 album Don't Blow Your Top was licensed to the label for US distribution. After touring with Ministry in 1989�1990, they signed directly to Wax Trax! and quickly became a part of the industrial music scene in Chicago that included Ministry, Front 242 and My Life with the Thrill Kill Kult. Konietzko then moved to Chicago in early 1991, and Esch followed a year later. After close friend and president of Wax Trax! Records Jim Nash died of an illness complicated by AIDS, KMFDM relocated to Seattle, Washington. The current line-up of KMFDM consists of Sascha Konietzko (vocals), Lucia Cifarelli (vocals), Andy Selway (drums), Steve White (guitars), and Jules Hodgson (guitar). 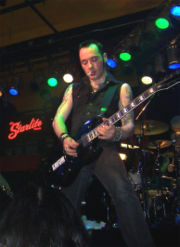 En Esch, Raymond Watts, and guitarist G�nter Schulz are notable key members in the band's history. Although Tim Skold is taking part on KMFDM's new album, Blitz, nothing has been stated on the band's website that he has returned to the band. Other notable musicians that have contributed to KMFDM projects include Bill Rieflin of Ministry/R.E.M., Nivek Ogre from Skinny Puppy and ohGr, John DeSalvo of Chemlab, F.M. Einheit of Einst�rzende Neubauten, Nina Hagen, and spoken word artist Nicole Blackman. Additionally, Chemlab, Die Warzau, Nine Inch Nails, My Life With the Thrill Kill Kult, and Giorgio Moroder have remixed music for KMFDM. Add a new Related Website.